Imagine a slice of life series, with a great balance between comedy and drama, and an excellent cast of well developed characters. Does a series like that really exist?. Based on a Manga that won the 55th annual Shogakukan Manga Award in 2009 in the "best shōnen" category, and my personal favorite manga to ever grace the pages of the Weekly Shōnen Jump magazine, I bring to you SKET DANCE. Disclaimer: This is part of a series of reviews of Anime which I think people should be more aware of. For that purpose I'm using the tag Ani-NOW, meaning Anime No One Watched, I'm tweaking the format a little to adjust to the objective of the review series: Try to make people interested in watching the show without spoiling too much. 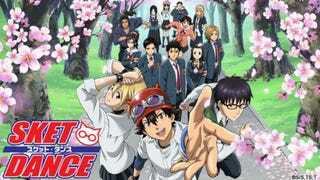 There's a huge, huge cast of characters in here, and the series manages to keep them all pretty interesting, specially the main cast in the SKET Dan and the guys at the Student Council. All of the main three characters have very interesting backgrounds, something that makes you care deeply for them. The excellent balance between the drama and the comedy is probably the strongest point of the series. One episode your sides will be hurting from laughing so much, and the next you will be shedding tears. Special mention goes to the 3 background arcs (one for each main character) also known as the "Big Seven", excellent stories detailing the reason behind all of the characters unique traits serving as "breather" episodes from all the comedy. The sound department is a bright point of the series, not only the voice acting is top notch but the music is excellent. One of the main bands involved in the series is actually a band formed specifically for the anime series, in this case The Sketchbook is the real life versions of Bossun, Himeko and Switch. But despite that, their music is great with lyrics that (of course) really connect with this show. Probably, the length. This is a gag/comedy series that at the end of the day lives and dies by its jokes, and the pacing can be overwhelming. This is one of the good examples of a series that can wear you down if you try to marathon it since some of the quirks of the show can get old if you don't give the proper space between episodes. In short: An great series with the perfect balance between drama and comedy, excellent character development, and a great example of how to manage a large cast of characters. Lives and dies by its jokes so the length can become a negative point if you try to marathon this. One of the few series that managed to me laugh and cry so hard. A series that flew under many people radars and one that definitely needs more attention. There is a full page dedicated to random facts for both the Anime and Manga in tvtropes, so I will use mine to highlight or expand some Anime specific ones that are not mentioned in that page. You know how I'm a sucker for the "Tales of" JRPG series, so you can imagine my delight when in episode 71 the Sket-Dan, while browsing the web to investigate the cause of one the characters radical change, found out that a concert was broadcasted from 1 am to 3 pm, and the band members look exactly like Luke, Tear, Guy and Jade from Tales of the Abyss. Shinohara Kenta is a fan of The Pillows (a band you may remember for contributing most of the OST of Gainax cult classic series FLCL, or for appearing in BECK, Mongolian Chop Squad, or being the inspiration for the names of some characters in K-ON). There's a whole arc (both in the Manga and Anime) where the song Funny Bunny plays a central role in the plot. Apparently in the Anime they had to use the new version contained in the album Rock Stock & Too Smoking, because the original one is licensed by Gainax for FLCL (As a fun fact, in the corresponding Manga chapter, one of the people present at the concert is wearing a shirt with a Happy Bivouac logo, which is the name of the Album that contains the original song). The pillows also contributed with the first ending of the series "Comic Sonic" and the vocalist of the band Sawao Yamanaka composed the lyrics of the sixth and final ending "Sekai wa Okujō de Miwataseta". In episode 31 of the Anime appears a young woman called Megumi Ogura which is obviously voiced by Saori Hayami. In the Anime's cast section though, the name of the seiyuu of Megumi Ogura is given as 亜豆美保 (Azuki Miho), which is the name of the main heroine in the Bakuman manga/anime series which is also voiced by Saori Hayami.